Today’s post was written by Jeff Teper, corporate vice president for OneDrive, SharePoint and Office. Today, during the SharePoint Virtual Summit, we unveiled the latest innovations for SharePoint and OneDrive, including powerful integrations across Office 365, Windows and Azure. These developments build upon the vision we unveiled last year, and have been delivering on since, with innovations to reinvent content collaboration and usher in a new generation of mobile and intelligent intranets. We also showcased Office 365 customers who are using SharePoint to accelerate their digital transformation. With more than 100 million monthly active users, Office 365 provides the most complete, intelligent and secure service for communications and collaboration. SharePoint plays an important role in Office 365, empowering customers to share and manage content, knowledge and apps to create a more connected workplace. More than 250,000 organizations and over 85 percent of Fortune 500 companies now have SharePoint as part of Office 365. In the last year, usage of SharePoint has grown 90 percent, content stored has grown 300 percent and more than 10 million new SharePoint sites have been created. More than 60 percent of SharePoint seats are now online, reflecting the value customers see with SharePoint in Office 365. We unveiled many innovations across SharePoint and OneDrive. Here’s a look at the four headline announcements. 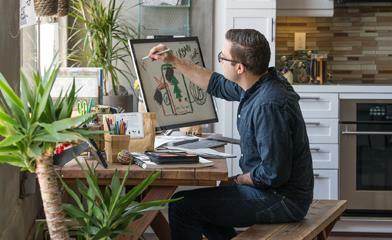 OneDrive lets you share files securely with anyone—inside or outside your organization. Its deep Office integration, which powers rich co-authoring, allows you to collaborate on these shared files with others in real-time. And it lets you access all your Office 365 files, including your individual work files and files shared with you by individuals, teams and the organization—regardless of whether you’re on a PC, Mac, an iOS or Android device or a Windows phone. 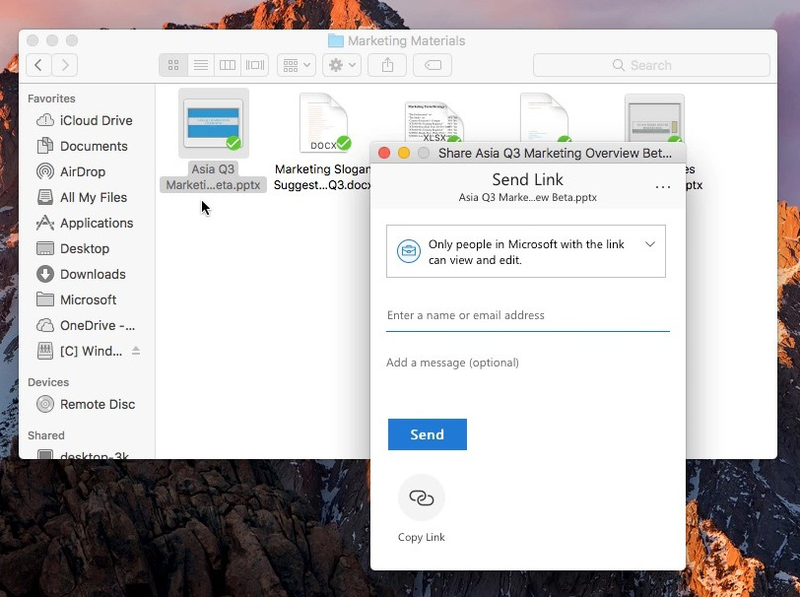 Building upon last week’s announcement of OneDrive Files On-Demand—which lets you work with all your files within File Explorer on Windows 10—we announced today that starting this summer you will be able to share Office 365 files directly from File Explorer on PC and Finder on Mac. The sharing experience has been simplified, so you can share a file or folder with specific people or send a link that enables anyone who needs access, inside or outside your organization. In addition, you can now control how long a link provides access, and you can easily view and modify the permissions you have granted. The new sharing experience is the same, whether you share on the web, in Explorer on Windows 10 and Windows 7, or in Finder on Mac. Share files and folders with colleagues inside and outside your organization directly from File Explorer on Windows 10 and Windows 7. Share files and folders with colleagues inside and outside your organization directly from Finder on Mac. Innovations that we’ve released over the last year and announced today are sparking customers to choose OneDrive over other file storage and sharing solutions. 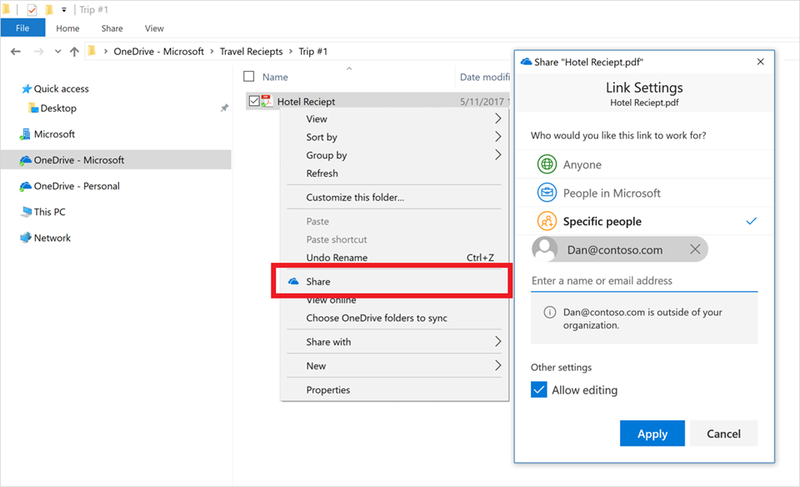 Read “File sharing and cloud storage with OneDrive and Office 365” to learn more. As the next step toward ushering in the next generation of intranets, today we announced SharePoint communication sites, coming this summer. A communication site is a beautiful, dynamic site that lets you reach a broad audience to keep the organization informed and engaged. Communication sites look great on the web, on a PC or Mac, on mobile browsers and in the SharePoint app. Communication sites can be created in seconds. You can configure the default web parts on your site’s pages to tell your story. You can customize page layout with new multi-column sections and drag-and-drop authoring with a range of richly functional web parts, including an image gallery, interactive Bing maps, videos from a Microsoft Stream channel and a new events web part. Add the Yammer web part to a communication site to solicit feedback and foster conversation. Yammer adds a conversational layer to the intranet, so you can drive employee engagement and share best practices across the organization, right in the context of a communications site. To learn more about Yammer integration with SharePoint and other Yammer announcements made today, read “New in Yammer—building a more engaged and connected organization” and watch Updates to Yammer—integrating conversations into your SharePoint experiences. SharePoint enables you, your team and your organization to streamline tasks, automate workflows and integrate processes seamlessly into your work—on any device and from anywhere you work. Starting this summer, you will be able to use Microsoft PowerApps to easily create custom forms that surface right in the context of a SharePoint list or library. Users can then create, view and interact with data using your custom form, rather than default SharePoint forms. This is a significant milestone for both SharePoint and PowerApps, as it empowers any user to drive transformation of team and organizational processes. We also continue to deepen integration of SharePoint and Microsoft Flow. 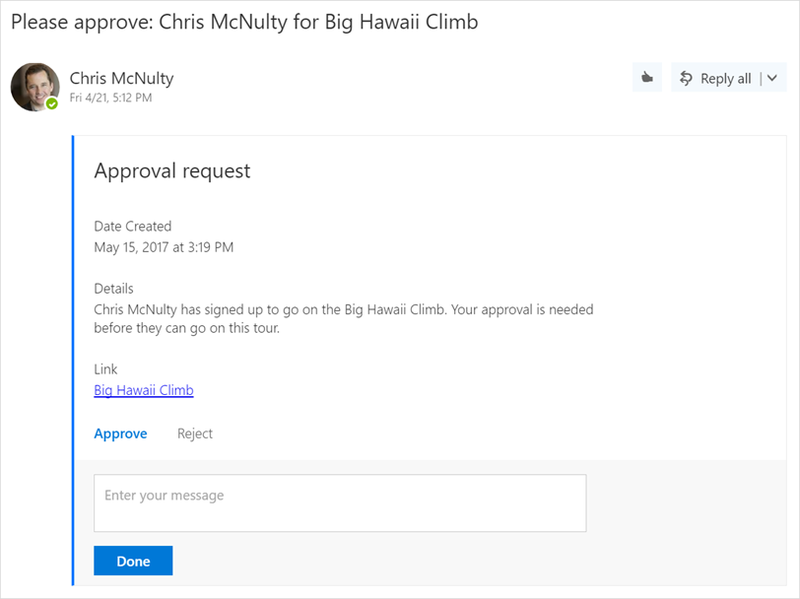 New built-in approval flows let you send any document for approval with a custom message. The recipient can approve the request directly from a rich, actionable email message, so approval and feedback can be given without leaving your inbox. Today, we announced a more personalized search that leverages machine learning and artificial intelligence from Microsoft Graph to surface more relevant and valuable results, faster. When you’re searching for knowledge, it may be found in content such as files, sites and news. And it might also be found through your colleagues. Now, your search results will include people whose skills, interests and projects—part of their Office 365 profile—are relevant to your query. Search results activate people cards, so you can learn at a glance about a person and the content they work on. One more click activates an extended view with richly detailed information from the user’s profile. These enhancements to search are rolling out over the next few months. These innovations illustrate our commitment to reinventing productivity, so that you, your teams and your organization can achieve more. Today, we showcased customers like DBS, Avanade, Shire and Fourlis who use SharePoint and OneDrive to achieve more. We’re honored to have them join the growing ranks of customers who are sharing their stories of success, including Rackspace, The Hershey Company, NASCAR, Qantas, T-Mobile and many more. If you missed the event today, you can view the recording of the SharePoint Virtual Summit.